What caused the current ToA radiative imbalance? More than fifteen months ago I wrote the post “What of the Pause?”, where I tried to analyse the state of the global climate with a special focus on the interesting developments following the 2011/12 La Niña. I have also later discussed that particular time period here. I have earlier pointed out the close connection between the SSTa in that central-eastern part of the narrow Pacific equatorial zone called “NINO3.4” and “global” SSTa over decadal time frames, how the former consistently seems to lead the latter in a tightknit relationship, firmly constraining the progression of global mean anomalies through time – flat (though with much noise) as long as the NINO3.4 signal remains strong enough to override (and/or control) all other regional signals around the globe, which most of the time it does. 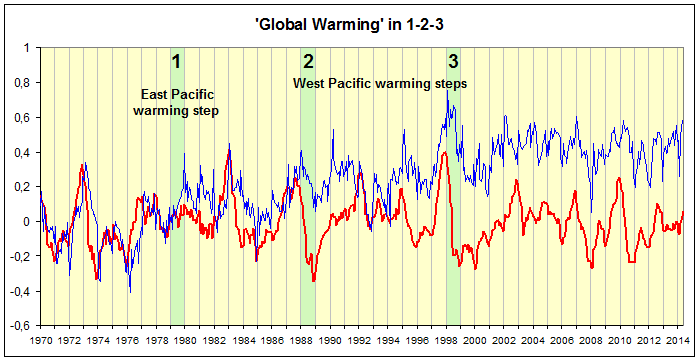 I have then proceeded to show how “global warming” (or “global cooling”) only appears to come about at times when the influence of this tight relationship on the global climate is somehow offset by surface processes elsewhere, meaning outside the NINO3.4 region. This obviously doesn’t happen too often, because it would take a very powerful and persistent process to disrupt and even break the sturdy grip of the NINO3.4 region on the leash with which it controls the generally flat progression of global mean temps over time. In fact, from 1970 to 2013 it evidently only happened three times. Which means that within these three instances of abrupt extra-NINO surface heat is contained the entire “global warming” between those years. Before, between and after, global temp anomalies obediently follow NINO3.4 in a generally (though pretty noisy) horizontal direction; no intervening gradual upward (or downward) divergence whatsoever. With the year 2015 completed, I felt an update of this NINO3.4-global SSTa relationship was in order. Is there evidence of a new step as of late …? Global SSTa has really been ratcheting up now for a while. At the moment, the strong ongoing El Niño is doing most of the work, but there is no question that even this has been provided with a significantly elevated baseline from which to soar, a raised mean level seemingly establishing itself already years before the current El Niño started moving. Well, it just so happens that this new level is higher than the old one by quite exactly 0.1 K. How can one tell? We noted and discussed already a year ago how the global lower troposphere has yet to respond to the conspicuous and mostly extratropical accumulation of surface heat in the NE Pacific basin starting in mid 2013. My opinion on the much talked about “Pause” or “Hiatus” in ‘global warming’ still said to be going on (the considerable final, level stretch of the upper blue curve in Figure 1), is thus naturally coloured by this understanding of how global temperatures normally progress through time, as exemplified by the period from 1970 till today. 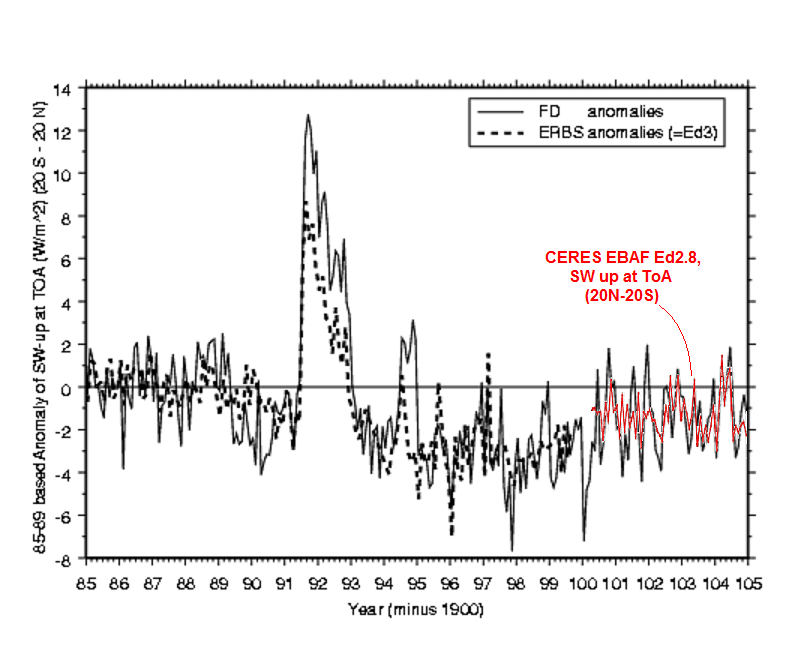 Within this perspective, the “Pause” is but one of many temperature ‘plateaus’ between sudden steps up or down (the last time it went down was back in 1964, before the ‘modern warming’). The relevant questions are: When did the last step occur? When will the next one take place? And will it go up? Or down? At the present time, I would still maintain that the last well-established step in global temperatures happened in 1998, following directly in the wake of the mighty 1997/98 El Niño. Simply because not enough time has elapsed to be able to say anything for certain about more recent events. ‘More than half.’ That sounds like a pretty conservative guess. Well, they end up going further than that. Much further. That should be a net range of anthropogenic ‘contributions’ to the general global temperature rise between 1951 and 2010 of 0.6 to 0.7°C.